Earlier this month, more than 1,000 people gathered for World Environment Day in Samarinda, the capital of Indonesia's East Kalimantan province. It was a moment -- shared by millions of people all over the world in different ways -- of reflection and action on the environment. It was against this backdrop that leading government, community and corporate representatives agreed to work together to change how development occurs in the province -- under the umbrella of a "green growth compact" that builds on plans begun in 2010. East Kalimantan is a microcosm for many of the world's development dilemmas, with its leaders grappling with the challenge of how to bring millions of people out of poverty without destroying the natural resources that local people and the local economy depend upon. It is a province on the frontline of sustainable development -- rich in forests, as well as huge coal, oil and gas reserves, and home to hundreds of thousands of village communities and endangered species such as orangutans. Both the UN system and national governments have recognized that achieving the targets of the Sustainable Development Goals will require overcoming sectoral and institutional boundaries and embracing a more integrated approach to growth. In East Kalimantan, there are already many commitments to a greener development path -- from different government departments and private sector players. In 2010, for example, the provincial government announced its intention to increase GDP by 80 percent by 2025, while simultaneously reducing deforestation-related carbon emissions by 80 percent, and achieving zero net deforestation. Alongside this, there are the commitments from palm oil and forestry companies -- such as the New York Declaration on Forests and the Indonesia Palm Oil Pledge. These provide genuine cause for optimism, but if pursued separately, the goals will be much harder to reach. The challenge of working in such a complex landscape system requires high levels of co-operation- which of course takes time. It is this type of collaboration that lies at the heart of the Green Growth Compact that stakeholders agreed to work toward in Samarinda. Those who signed up to work toward the compact include many of those with existing commitments, and the list is long. Led by East Kalimantan's Governor Awang Faroek Ishak, the list includes: the provincial government, the national Ministry of the Environment and Forestry, six district heads, four universities, four natural resource companies, one customary leader, and two international non-governmental organizations and development agencies, including The Nature Conservancy. Back in December, at COP 21 in Paris, East Kalimantan presented its vision for a sustainable development trajectory. It is an ambitious set of goals, but there are already many examples of progress that can still be improved and scaled up. Again, the list is long -- and involves all levels of society. It includes the Government's One Map policy which is aimed at improving governance of forest areas and land-use disputes; private sector commitments; the establishment of a 265,000-hectare orangutan corridor in the Wehea Forest; the progress made by the Forest Management Unit (or KPH in Indonesia) where forest management concessions are moving to a sustainable model; the jurisdictional models for low-carbon development in Berau, KutaiBarat; and the village green growth models. East Kalimantan, in fact, will serve as a pilot for the Forest Carbon Partnership Facility -- the global partnership of governments, businesses, civil society and indigenous peoples. If successful, it will serve as a demonstration of how results-based finance can support the transition to a low-carbon model for economic development. The Compact targets equally ambitious goals -- and on a much bigger scale. Its success will depend in large part on strong leadership by the provincial government and its ability to catalyse effective co-operation among diverse groups and add value to all the existing initiatives and commitments. Action at the sub-national level is increasingly seen as a key component of climate action, particularly in tropical forests countries. 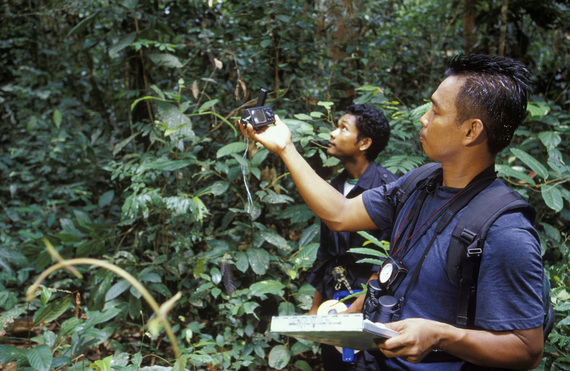 East Kalimantan is gearing up to be a leading example of what integrated action across all sectors of the economy -- and that links public and private sector action -- can do. The Green Growth Compact is a great vehicle to coordinate the action. The compact will be discussed at the upcoming REDD+ Exchange event in Oslo. Explore The Nature Conservancy's latest thinking, science and recommendations on climate and land conservation.